All guests of Moulin de Laval are requested to write a few lines in the guestbook. Here are some highlights. Did you know the mill is rated 9,1 on holiday homes review site Zoover? "We never had such a festive and delicious Pentecost before as in this spot of Moulin de Laval! Regenerated and tanned we travel home, sending many thanks to the place and the miller." The terrace on the east side: the perfect lunch spot. 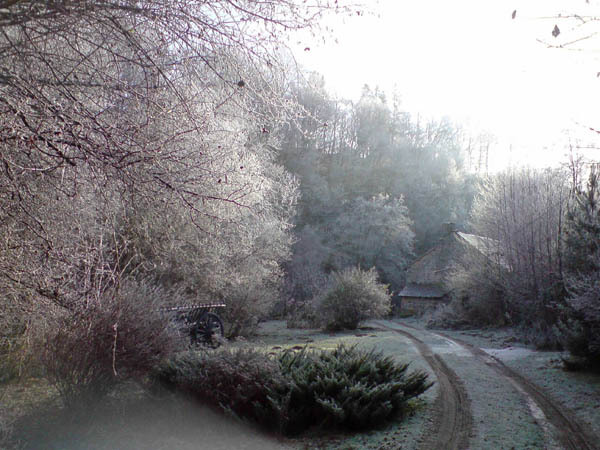 "Moulin de Laval was exactly what we expected: nature, quietness, authenticity. In the evenings we stayed outside till 9 PM. We took beautiful walks from the books in the mill. Super! A great spot worth the effort. 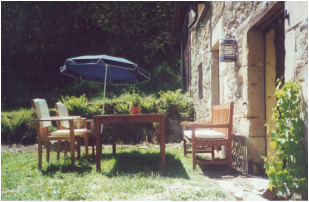 I hope the next guest will enjoy the place a much as we did!" "Weather and entourage were very enjoyable. We were happy to be completely on our own. We will do this again!" 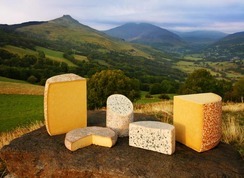 The Auvergne produces tasty cheeses, like Cantal, Saint-Nectaire and Bleu d'Auvergne. About 500 yards from the mill lives a woman who fabricates goat cheese - available in all sorts. Goats to be stroked. Sometimes they show up on the other side of the brook. "Our week is finished. What a week! What a location. Unique. A place to envy: the garden, the brook, the silence. Fantastic. PS Try to taste as many cheeses from the area as possible. The moldier, the better! "Most nights we sat outside till 9 PM, sipping in nature. Many butterflies and lizards. A fine house to honor and to frequent. Unique. Thank you for the hospitality." "Our dogs had the time of their lives, walking around freely. Just great!"